WOONSOCKET HEAD START CHILD DEVELOPMENT ASSOCIATION, INC.
Breakfast, lunch, and a nutritious snack are provided. Our educational program is designed specifically for preschool aged children. We follow the best practices in the field of early childhood education because your child deserves nothing less than the best. Research tells us that young children learn best by doing. True learning is not just an ability to repeat the words of someone else, but requires active thinking, engaging and experimenting to find out just how things work, and learning first-hand about the world around us. At WHSCDA, Inc., we create that environment for your child to stimulate his or her curiosity and learning. By environment, we mean materials and activities as well as the interactions with others. All of this happens in the context of play, because play provides the foundation for children's academic or school learning. 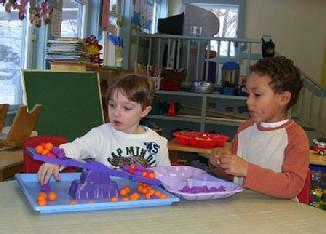 It is through play that children will achieve their educational goals. Play is the work of young children. Our goal is to help children become independent, self-confident, inquisitive learners. We encourage them to be active and creative explorers of their environment who are not afraid to try out their ideas and to think their own thoughts. We allow them to learn at their own pace and in ways that are best for them. We help them develop good habits and attitudes, particularly a positive sense of self, which is so important for success in school and in life. Our curriculum, The Creative Curriculum®, is aligned with the Rhode Island Early Learning Standards. These Standards, issued by the Rhode Island Department of Education, are the goals and expectations of what preschool children should know and be able to do. To view WHSCDA, Inc.'s Preschool Handbook, click here. click on the appropriate link below.